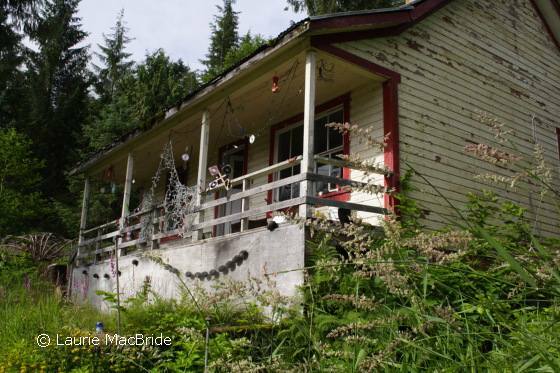 In the 1920s and 30s, the cannery town of Butedale, located on Princess Royal Island in BC’s Inside Passage, supported a summertime population of more than 400 people and a thriving industry, powered by the strong waterfall flowing down from Butedale Lake, just above the town. 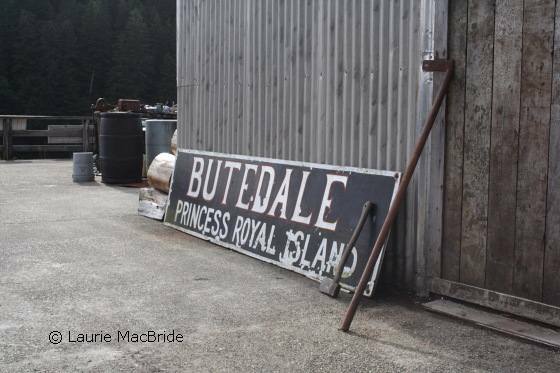 Even after the cannery closed in the 1950s, Butedale’s cold storage plant continued to be important to commercial fishermen for another two decades. But its glory days are long gone now. 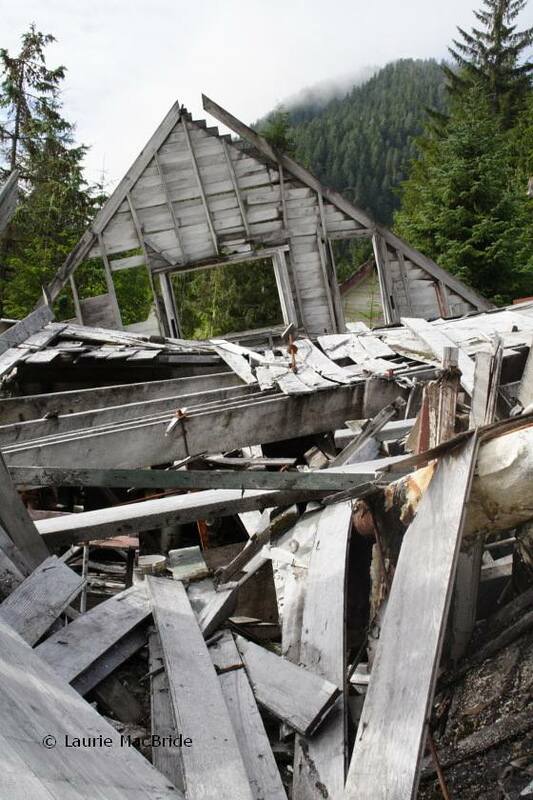 Today, a sole caretaker lives in the old cookhouse and presides over the ruins of the town: the fallen-down remnants of its once-proud cannery, post office, store, bunkhouse and other buildings disappearing under the ever-advancing forest, salmonberry and wildflowers. It’s amazing – and fortunate – that from the debris, he somehow manages to salvage the necessary bits and pieces to keep the generator running and the docks floating. 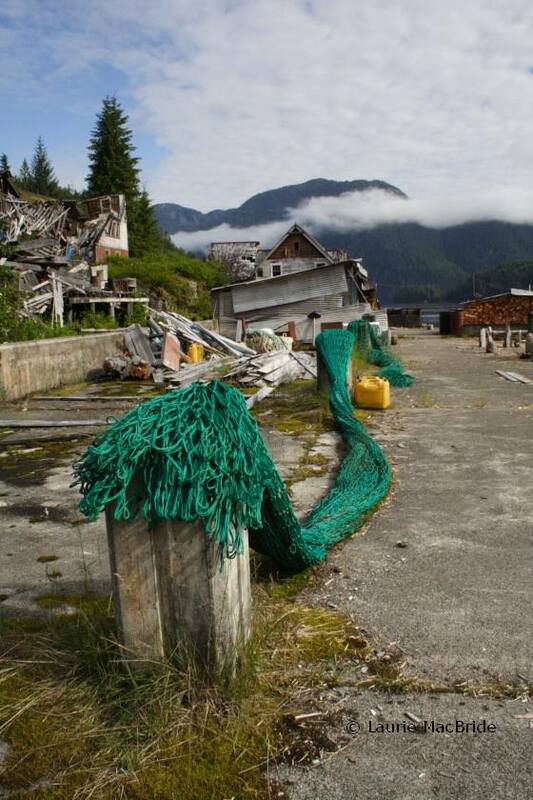 For despite its dilapidated state, the ghost town of Butedale is vital for boaters and fishermen even today, because it offers protected moorage – something otherwise lacking in the long stretch of deep water along this part of the Inside Passage, where steep mountains fall straight into the sea, making anchoring a challenge, to say the least. The last time I checked, Butedale was for sale. I certainly hope that whoever eventually buys it honours this ghost town by preserving what remains of its past and welcoming visitors to experience our coastal history, closeup. 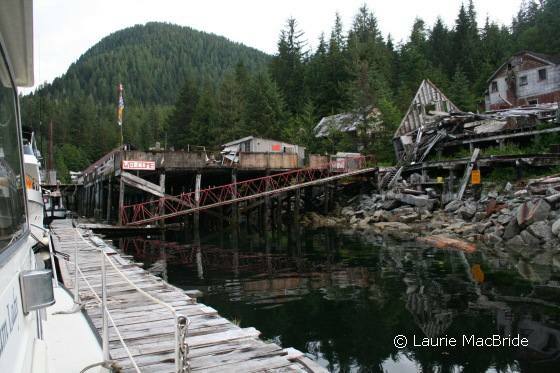 Posted by Laurie MacBride, Eye on Environment on October 1, 2011 in BC coast, Boating, Central & North Coast, Coastal History and tagged canneries, fishery, ghost towns, Inside Passage, North Coast, photos, places. As a kid growing up in Butedale was awesome. It was our happy place, we were care free and we did what ever we felt like. Time didn’t matter to us. Sounds wonderful, Gary! Thanks for visiting the blog and for commenting. It’s great to hear from someone who lived in Butedale.